Races—Aasimar, Catfolk, Deoxyians, Dhampirs, Grippli, Ifrit, Kitsune, Kobolds, Mechanoi, Nagaji, Oreads, Samsarans, Suli, Sylphs, Tengu, Tieflings, Undine, Vanaras, Vishkanya, and Wayangs! Classes—Updated versions of the Bard, Cleric, Magus, Paladin, Ranger, and Wizard! Companions—Paladins and rangers have lots of cool companion options. Feats—Support feats for the new class options, plus fun possibilities for characters of any race or class! Computers—New modules and upgrades, plus tons of pregenerated computers to save GMs and players both considerable effort! Starships—More options, and lots of pregenerated Starships to drool over! Spells—7th, 8th, and 9th level spells, plus lots of old favorites brought into the Starfaring Age! And More! All ready for any campaign, but including the flavor needed to integrate smoothly with RGG's Blood Space setting, the background flavor in the Starfarer's Companion can be a stand-alone adventure ground, or just Another Place in the Galaxy of Your Games. The Starfarer's Companion is written by Alex Augunas and Matt Morris, with the assistance of Matt Banach and Owen K.C. Stephens. This massive expansion-tome for Starfinder clocks in at 235 pages, 1 page front cover, 1 page editorial/ToC, 1 page SRD, 2 pages of advertisement, 1 page back cover, leaving us with 229 pages of content, so let’s take a look! This review was moved up in my reviewing-queue as a prioritized review. Okay, so the content herein is contextualized by the Xa-Osoro system – while we only get a brief introduction to this meta-setting, it does influence components of the following material – for example, the languages, which are noted in the beginning of the race section. Speaking of which: This is basically a massive crunch-book that takes care of several concepts that are beloved, yet not already covered by SFRPG; as such, we begin with races. A ton of them. As such, the respective racial write-ups note homeworlds, society and alignment, etc. I’ll be brief regarding the races, since most of them should be familiar to PFRPG players. Aasimars: +2 to one ability, 4 hp, resistance to acid, cold and electricity (“resistance” is missing once, in a purely cosmetic hiccup) as well as SR equal to 6 + character level versus evil spells. They gain +2 to Diplomacy, Perception and Intimidate, have darkvision and can manifest a halo, which acts as a portable light with an item level equal to or less than the aasimar’s level. I assume that to be “character level” – minor hiccup in the rules here that happens twice – also in regards to the Daylight 1/day SP. Catfolk gain +2 Dex and Cha, -2 Wis, 4 hp, +2 on Reflex saves (and 1/day roll twice, take the better result), low-light vision, +2 to Perception, Stealth and Survival and +10 ft. when charging, running or withdrawing. The deoxyian race would be all new: They gain 6 hp and choose a player race at 1st level. They count as the chosen race and as deoxyians and develop a racial trait of the chosen race. More can be chosen by taking Expanded Deoxyomorphism as a replacement feature at 2nd, 4th, 6th, 12th or 18th level. They gain +2 Int, +2 to an ability of their choice and -2 to an ability of their choice that does not already have a “bonus from race.” 1/day, they can take 10 on a d20 roll or check (except those failing on a natural 1) and gain +1 to checks they take 10 in. Dhampirs get +2 Dex and Cha, -2 Con, 4 hp low-light vision and darkvision and are dazzled in bright lights. They gain +2 to Perception and Bluff and when saving against disease and mind-affecting effects and take no penalties from level drain, though they still can perish from accrued negative levels. Grippli (YEAH!) get +2 Dex and Wis, -2 Str, 2 hp, speed 20 ft. (plus climbing speed 20 ft.), +2 to Stealth, darkvision, +4 to Athletics made to jump (and are treated as having a running start). They also secrete poison 1/day as a swift action (which passes grippli armor to be on the outside of it – think semi-permeable membrane) and may coat their melee weapons in the poison. Ifrit gain +2 Dex and Cha, -2 Wis, 4 hp, darkvision and may create the flashlight equivalent of flame as a free action. 1/day, as a standard action, the ifrit can generate a firebomb with an item level equal to the ifrit’s level (should be character level). They gain +2 to saves versus fire-based effects and +2 to initiative. Of course, we also get Kitsune, who gain +2 Dex and Cha, -2 Str, 4 hp, +2 to Acrobatics and Athletics, change shape and Kitsune with Cha of 11+ gain at-will dancing light. They may choose Magical Tail as a replacement class feature at 2nd, 4th, 6th, 12th, and 18th level. They also gain low-light vision and their natural weapons deal 1d3 lethal damage and isn’t treated as archaic – analogue to the Vesk ability. Kobolds get +2 Dex and Con, -2 Str, 2 hp, are Small, get +1/2 level (should be character level) to damage rolls with attacks and spells versus foes that are flat-footed, off-kilter or denied their Dexterity bonus. They get +2 Engineering, Perception, Profession and Stealth. They also gain a 1d2 natural weapon, otherwise analogue in function to the Vesk. They gain +1 resolve point at 1st level and have darkvision and are dazzled in bright light. Mechanoi are sentinet constructs with the technological subtype. They have a size of Small or Medium, speed 20 ft. and have no Constitution score. Problem here: Having one ability score less does influences character creation/point assignment – the pdf should acknowledge that and provide alternate. The race gets +2 Str and Int, -2 Cha, 6 hp, +4 to saves versus mind-affecting effects (and no immunity). Spells that target constructs or robots and don’t allow for saves now do for the race, with an engineer. They take -2 to Sense Motive and such checks against them are also at +2 DC. They also get to choose to minor mods and a major mod, which work as basic drone mods. Once chosen, this can be changed via a mnemonic editor. Additional Mechanoi Mod may be chosen as replacement feature at 2nd, 4th, 6th, 12th and 18th level. Mechanoi have low-light vision. Nagaji get +2 Str and Cha, -2 Int, 6 hp, +1 to AC, low-light vision, +2 to Perception, +2 to saves versus poison and mind-affecting effects. They can spit poison as a ranged attack versus EAC, 10 ft. range and one range increment. The poison temporarily blinds foes on a failed save and may be used 1/day. Oread get +2 Str and Wis, -2 Cha, 8(!!!) hp, 20 ft. speed, darkvision, +1 to AC, 1d3 natural weapon (analogue to Vesk) and +2 to saves versus acid- and earth-based effects and attacks. They also get acid resistance 5. Samsarans receive +2 Int and Wis, -2 Con, 4 hp, low-light vision, +2 to saves versus death- and negative-energy effects and to saves to remove negative levels, They also get +2 to Constitution checks to stabilize. They get one 0-level mystic spell as an at-will SP and may choose Minor Psychic Power sans meeting the prerequisite. They gain +2 to two skills of their choice and add them to their list of class skills. Suli get +2 Str and Cha, -2 Int, 4 hp and low-light vision. They gain acid resistance, cold resistance, electricity resistance and fire resistance 5. As a swift action 1/day, they can shroud their arms in elemental energy (4 types mentioned before), for +1d6 damage of the chosen type to “all attacks made with their hands or weapons held in their hands.” – I think this is supposed to refer to melee weapons, but RAW, it holds true for ranged weapons as well, which is a serious difference regarding the power of the ability. The ability lasts for 1 round per character level. Sylphs have +2 Dex and Int, -2 Con, 2 hp, darkvision, +2 to Acrobatics, Piloting and Stealth. They gain electricity resistance and +2 to saves versus air- and electricity-based effects. They can use Acrobatics to glide. They also increase their maneuverability by one step. Tengus get +2 Dex and Wis, -2 Con, low-light vision, +2 to Culture checks (and learn 2 languages per rank in Culture gained). They get +2 to Perception and Stealth and natural weapons (1d3); they are proficient with basic and advanced melee weapons and gain specialization with them at 3rd level. Tieflings get +2 Dex and Int, -2 Cha, 4 hp, darkvision, +2 to Bluff, Slight of Hand, Stealth. They get cold, electricity and fire resistance 5 as well as SR 6 + character level against good spells. They gain a fiendish extremity and may choose to gain one as a replacement feature at 2nd, 4th, 6th, 12th and 18th level. These include a prehensile tail, scaly skin, natural weapons and vestigial wings. Undine gain +2 Dex and Wis, -2 Str, 4 hp, swim speed 30 ft., can breathe water and doesn’t take penalties when fighting underwater. They are immune to the effects of depth and pressure and gain Athletics as a class skill as well as darkvision. They can quench up to 5 sq-ft. fire with a touch sans taking damage and 1/day may execute bull rush, disarm, dirty trick (blind/dazzle only) or trip with a 30 ft.-range. They can use their character level instead of BAB for the roll. Problem: The ability doesn’t specify the activation action – I assume standard action. They get +2 to saves versus cold-and water-based effects. Vanara get +2 Wis, 4 hp, are shapechangers, with 30 ft. speed, 20 ft. climbing speed, may change size between Small and Medium and, while Small, they get +2 Dex and -2 Str, but their Dex in medium armor may not exceed 16. Longtails get +2 Acrobatics, Sleight of Hand and Stealth and have a prehensile tail that can hold +1 item at the ready. Whitecape vanara get +2 Athletics, Intimidate and Perception, Improved Unarmed Strike and +2 to KAC versus bull rush and trip. They gain low-light vision. Vishkanya get +2 Dex and Cha, -2 Wis, 4 hp, get +5 Disguise to pass as humans, +2 to Acrobatics and Stealth, low-light vision, +character level as a bonus to saves versus poison. When they have taken at least 1 hp damage, as a swift action, they can 1/day apply their poisonous blood (saliva sans damage) to melee weapons. Wayang get +2 Dex and Int, -2 Wis, 2 hp, 20 ft. speed. I am not sure regarding their size – I assume Small. The race gets darkvision. They can, as a standard action 1/day use invisibility as a SP. Wayang can reverse spells that behave differently versus undead/the living as a reaction, counting as undead or living, respectively. This can be used 1/day. They gain +2 Perceptio and Stealth and +2 to saves versus illusions. All right, as a whole, the race-chapter has me a bit concerned. While there is no really broken race herein, there are a couple of races that exceed in power what we get in the Starfinder core book. More relevant would be the numerous cosmetic hiccups in rules-language (level vs. character level – particularly weird, since some abilities (like natural weapons) taken directly from the SF core book’s abilities often specify character level in the core book… There are also a few instances, where the rules are a bit wobbly. Not to the point where I’d consider the section problematic, but it’s less refined than what I’m used to see from the authors. Okay, so next up would be no less than 6 (!!!) classes for SFRPG: We get an adaptation of bard, cleric, magus, paladin, ranger and wizard. In all brevity: Bards get 6 + Con stamina, 6 hp, 6 + Int skills, proficiency with light armor, melee weapons, grenades and small arms. Spontaneous spellcasting of up to 6th level (governed by the muse – may be Int, Wis or Cha), ¾ BAB progression and good Ref- and Fort-saves. Okay, so the class itself probably doesn’t need a discussion on how it works, so let me note what I enjoyed here: Even bardic knowledge has choices; bardic performance is properly codified (Audible/Visual) and the class gets talents to choose, an array of two classes of talents, which allow for PC customization. Definitely one of the best bard versions for d20-based games. The cleric gets 6 + Con stamina, 6 hp, 4 + Int skills, ¾ BAB-progression, good Fort- and Will-saves, proficiency with light and heavy armor, small arms, deity’s favored weapon, grenades and prepared spellcasting governed by Wisdom. Now here is an aspect that may provide a bit of confusion at first: Unlike in Starfinder’s usual design paradigm, the spellcasting of the cleric goes the full 9 levels; granted, some spells of the mystic or technomancer note that the higher-level cleric spells behave as lower-level mystic spells; and yes, there are a ton of converted spells. Similarly, the class provides AoE-healing via channel divinity – basically, you don’t have to choose to be the healer mystic, you get this regardless of choices made. On the plus-side, domains and devotions allow for a ton of customizations for the class, which, choice-wise, is really cool to see. The magus presented herein gets 6 + Con stamina, 6 hp, 4 + Int skills, ¾ BAB-progression, good Fort- and Will-saves, prepared Int-based spellcasting of up to 6th level. Spellstrike is tied to resolve and works with both melee weapons and small arms. The class does what you’d expect. The paladin gets 7 + Con stamina, 7 hp, 4 + Int skills, proficiency with light & heavy armor, basic and advanced melee weapons, small arms, longarms and heavy weapons. They have full BAB-progression and good Fort- and Will-saves. At 4th level, they get spontaneous Cha-based spellcasting of up to 4th level, drawn from the cleric list. Lay on hands has nice limits and is tied to resolve. The customization comes in with different oaths and associated abilities. Solid version. The ranger gets 7 + Con stamina, 7 hp, 4 + Int skills, proficiency with light armor, basic and advanced melee weapons, small arms, longarms, sniper rifles and grenades, full BAB-progression, good Fort- and Ref-saves. Beyond tracking, rangers come with a more complex modification – their styles allow for meaningful choices. Spells, for example, are spontaneous, Wis-based and drawn from the mystic’s list and are exclusive to one style. There also are a ton of talents, ranger methodologies that help, big time, to make the class feel unique. Finally, the wizard gets 4 + Con stamina, 4 hp, 4 + Int skills per level, proficiency with light armor, basic melee weapons, small arms, grenades, ½ BAB-progression, good Will-saves, prepared Int-based spellcasting from the wizard’s list. Much like the cleric, the spell-levels go the full 9 levels of progression, thus deviating from Starfinder’s basic spellcasting engine. The wizard has a spellpad and the usual bond – object or familiar. There is a ton of customization via both arcane secrets and a massive array of arcane traditions. Notes for alternate or replaced class features are provided for all classes covered within this book. The book does come with a nice companion-building engine that covers both biological and technological companions: Hit points scale up from 10 to 230; companions have ¾ BAB-progression, gain up to +18 AC; their good saves increase to +9, the bad saves to +5; 6 ability increases, up to 8 feats and up to 10 evolutions. Link, share spells, (improved) evasion, devotion – you get the idea here. The book does contain a TON of feats – the table covers 3 pages on its own! Beyond the obvious ones (like Fox Shape, Magical tail, etc.) that supplement the races and those that supplement the classes, there are several rules-relevant ones beyond that. Though, much like in previous chapters, there are more editing hiccups here than usual for Rogue Genius Games or the authors – “as areactiont action”, for example. Options for paladins to revive those that have just died, better exploring of new environments – it should be noted that quite a few really cool options can be found in this chapter. There are quite a few feats here that allow for the use of limited racial abilities via Resolve expenditure. So yeah, this chapter, as a whole, is nice. In the equipment chapter, things become really cool: We get not only various shields, we also are introduced to computers – to be used as basically a complex help or hindrance for the PCs – modules, basic functions, secured access, tier-rating,e tc. – all in all, a cool array with a ton of sample computers provided. I smiled from ear to ear when I read an expansion to the starship scale: Planetoid! It comes with a new frame and we also get a serious array of cool new frames. This is easily my favorite chapter in the whole book. The final, approximately 60 pages, are devoted to a massive TON of spells. Since this book adds 9th level spellcasting to Starfinder, there are some explanations regarding variable level spells for the spells. The chapter, as a whole, provides a ton of the spell-classics we know from PFRPG – wail of the banshee, for example. It inflicts a massive 150 points of sonic damage, ½ on a successful save. If you are really picky about design-aesthetics, you will note that e.g. snuff life from the core-book follows a different design-paradigm that codifies damage for death effects by CR. On the plus-side, I really like that quite a lot of the spells have different effects for the different spell-levels – not just an escalation of numbers, but wholly different effects. The conclusion of my review can be found here! What we have here is a book largely of conversions that needed one more round of review and editing before it was released. The races are wonderful, the art is solid, and the classes look good at a glance. That said, there are instances you are still going to need to convert for yourself: AC bonuses that is not specified in type (KAC vs EAC), along with use of no longer valid bonus types such as: Dodge, Resistance, Sacred, and Shield. Once you get passed that, it looks to be a sound conversion (or reimagining in some cases) of what we had in Pathfinder and I look forward to seeing the rest of Pathfinder's classes seeing the stars, be it officially or under the guise of Rogue Genius Games. Is there a paper copy? Not yet. Alex Augunas said that they want to be sure that they have cleared up all the typos and other errors before they commit it to print as a hard copy. We don't have nearly the resources a big company like Paizo has, so things are more likely to slip through. Since we don't want to give you print copies with those errors, it's pretty standard practice to release the PDF, wait about a week to see if there's anything major we missed, and then get those print copies rolling. DriveThruRPG will have them first. (They have a Print on Demand service.) Once it's ready, we'll send copies to Paizo and to the Open Gaming Store based on demand in those areas. So if you want to buy your print copy here at Paizo, make sure you let us know so we have an idea of how many to stock. Looks good :D Picking this up now, thanks! What I want is Starfinder classes converted back to Pathfinder. Any chance that's in the works? Owen's talked about it, but we don't have definite plans yet. Id pay for a "warlord" envoy. So finished reading this and Blood Space & Moon Dust, and I hotta say, great job guys. Also REALLY looking forward to more about Blood Space, as I really want to use that is a setting in my Starfinder Campaign. Any chance we'll be getting more soon? I plan on getting this when I get payed again. Is there any sort of follow up in the works? Short Answer, there will be more Blood Space. Long answer: Matt Morris and I are going to do bits and pieces of Blood Space info in small products-mine will be in the Star Log.EM products and Matt Morris's will be in an unannounced product series RGG is going to do. Meanwhile, Matt Banach and I are currently and actively building up to a (roughly) 200 page Blood Space campaign setting guide book that we would like to have published in early 2018. Dates are still in flux, but plans are moving! I don't know what will be in it yet, but people seem to REALLY want monk and Owen wants alchemist, to the point where I wrote a bomb mechanic to prove it could be done in a cool and balanced way for SF. We currently have print copies of this available at DriveThru and the Open Gaming Store, because we can link them directly to our POD accounts. We'll get print copies here, if we can find a way to make that economically viable. We're working on smaller follow-up[s at the moment, in part so we can give people time to absorb what we've done, and so we can see how the third-party Starfinder-compatible market develops. That said, another big book is definitely something we have our eye on for the future. If there are specific things you'd love to see in it, by all means let us know! A conversion for the Occultist, preferably using hybrid items for Implements. Yeah, that totally WOULD be cool. I'd also like to do the kineticist some day, but I haven't decided whether it would be easier to try and design something new or update all of the spells so I could convert the talents, or some combination of the two. The kineticist is an amazing beast of a class that's balanced on a razor's edge, after all. 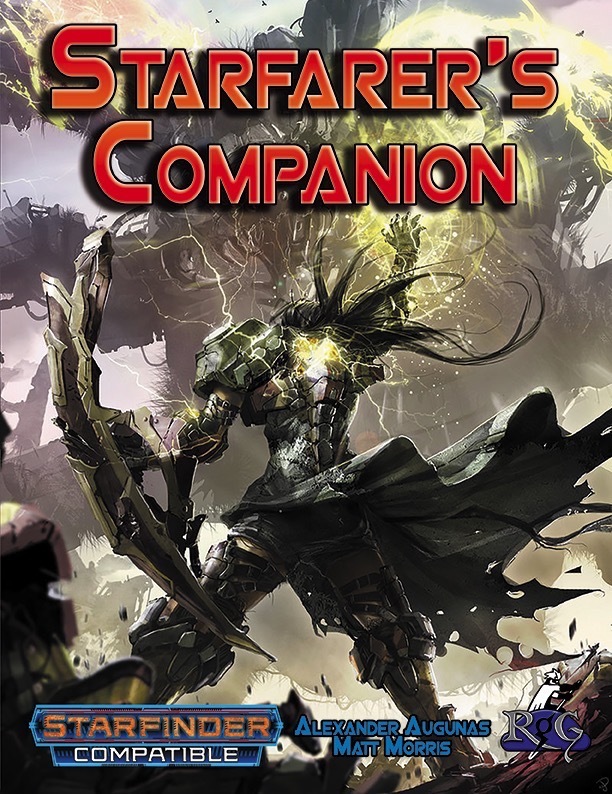 If you're looking for ideas to include in an Advanced Starfarer's Guide, I'd personally love to have inquisitors, sorcerers, and vigilantes included among the classes converted from PFRPG to Starfinder. This is just my opinion, of course, but I wouldn't do the vigilante as a class. I would (and am) going to do it as a Starfinder archetype. It fits better with the concept and execution of the class. That way I wouldn't need a warlock or a zealot; I would just have a wizard or a cleric with the vigilante archetype. In fact, you are probably going to hear about me tackling this REALLY soon. I agree, the vigilante's core conceit, it's dual identity, should be available to any character that's willing to make the tradeoffs for it, regardless of their class. I look forward to seeing what you do with it! So what were the changes in the latest update to the PDF? I only caught the fix for the erroneous reference to the spell list for the magus class. Latest fix was a correction in the credits. By the way, please do a mecha sourcebook for Starfinder please!? I was actually disappointed that Mechwarrior and Gundam were left off the list of things that inspired Starfinder. It would be cool to see Gundam-like mecha piloted by kitsune! I absolutely want to do a mecha book at some point; Iron Blooded Orphans is a huge inspiration for most of my Starfinder works. That's wonderful news! I look forward to seeing one get done! Heck if you start a kickstarter I'll be sure to help out! I've just finished binge watching Iron Blooded Orphans not too long ago and now I'm starting to binge watch Gundam Unicorn and Gundam Seed. So it would be awesome to if Everyman Games did a Starfinder mecha sourcebook! In addition to a sourcebook on the Xa-Osoro System. It is a very interesting setting. It's a tough line to deal with that likely requires different "tiers" of mecha; some giant robots Gundam-style and some smaller ones for characters who want to use mecha all the time and have them be balanced for ordinary combat. We'll see what we can come up with! Well I know that d20 Future and especially the Manga and Mecha sourcebook from the Mutants and Masterminds system have ways to fix what you've mentioned. Maybe you could look at those for ideas. I know that they have different tiers for mecha as well as info on how to do flaws and special attacks for mecha. I also want to say that the Dynastic Races Compendium was amazing as well. The ethnicities parts were a great addition. They gave me some ideas for a kitsune-like race I'm developing and they gave me some wonderful ideas and inspirations so I must thank you for that. I've never heard of Guilty Crown before. I'll have to look at it. Add me to the list of those who would purchase a print copy of this. It's a great anime. I think James and I watched it on Crunchyroll, but you could definitely find it on 9anime if that's more your speed. I'm almost positive that they're currently available on DriveThruRPG as a print on-demand book. Not sure about whether they're coming to Paizo.com—that's more of an Owen question then an Alex question. Editing and formatting are good on both a formal and rules-language level – as a whole, this book may contain quite a few hiccups, but most of them do not influence the rules-language. Layout adheres to a really nice two-column full-color standard with a lot of neat, original full-color artworks. The pdf comes fully bookmarked with nested bookmarks. Cool: The pdf comes with a second, more tablet-friendly, smaller version – kudos! Alexander Augunas and Matthew Morris deliver a book that a select clientele will absolutely adore. This massive tome nets you all the options you’ve come to expect from the time playing Pathfinder – the favorite races of many folks, and, more importantly, also the classes – if you’re looking for a way to transition your PFRPG-game to Starfinder, then get this ASAP – this is *exactly* the book you’ve been waiting for. The craftsmanship of the design for the class conversions is definitely high quality; the player agenda components, the choices, the engines of the classes – all of these are done with the expert skill-set that we’ve come to expect from these two critically-acclaimed designers. I can absolutely see why so many people (judging from the reviews) love this book. At the same time, as a person, while I appreciated the skill that obviously went into creating this book, the supplement left me honestly concerned. As a book that deals with a lot of heritage options, it does exhibit a lot of design paradigm decisions that I could not extrapolate from the Starfinder core rules. It should be noted that I do not think that 9th-level spell-progression breaks the game; it allows for a finer-grained progression of power, obviously – but honestly, I’m not sure why this type of decision was required by the demands of the system or the design of the classes. Another issue I can see here would be the cleric’s healing abilities, which are very pronounced – more so than those presented in the Starfinder core book. Why do I consider the totality of these design-choices problematic? While they remain closer to PFRPG and thus easier to convert, they change the gameplay of Starfinder. While, admittedly, my playtesting experiences with the Starfinder rules so far are not as excessive (the system is pretty young, after all), so far, it looks like the discrepancy between the power of martials and casters has decreased, courtesy, in part, due to the cap imposed on casting potency. This book subverts these pretty central tenets. There are a few remnants regarding references to bonus types that don’t exist in Starfinder, some references to AC bonuses that have not been properly recoded for SFRPG, but these instances remain relatively scarce. More grievous to me, there are, design-wise, some aspects in spells, etc., that feel closer in their design-aesthetics to PFRPG than SFRPG. Okay, so rating this book, for me, is pretty much a reviewer’s nightmare. Sure, I can complain about the formal hiccups mentioned, but they are not that many really bad ones; they mostly pertain to smaller aspects and components. My issue as a reviewer is that this book covers options to make Starfinder closer to Pathfinder. It’s the goal of the book and, for what they are, I love a lot of the designs here – I enjoyed, for example, the converted classes more than I thought I would. Here’s the thing: As a person, I really, really dislike that. One of the aspects I love about Starfinder is that it’s not just PFRPG with a coating of scifi. New races, new classes – all different, shiny, new. I think that, for a serious part of this book, you can see that, while it *is* definitely a Starfinder book regarding the totality of the rules, its design aesthetics in the smaller components, tend to have sprinklings of PFRPG inside. This is understandable; it’s not bad…but it rubs me the wrong way and that sense, particularly combined with the hiccups here and there, left me with this constant feeling of unease regarding, particularly, the full casters herein. In short: This book was, most assuredly, not made for me. At the same time, it is my responsibility as a reviewer to acknowledge that it represents what a TON of people wanted and enjoy – and, while not perfect, it does achieve its mission statement in a rather admirable manner. That’s why, ultimately, my final verdict will clock in at 3.5 stars, rounded up for the purpose of this platform. If you wanted more of your favorite PFRPG options in Starfinder, feel free to add another star. Is there an errata list somewhere? I have the PDF, and I'd like to check errata before asking about a couple of things I've found. So, looking at the Spiritual Weapon spell (p.224), there are several anomalies. Duration is concentration, which isn't a thing in Starfinder. It specifies that the weapon may be moved, but not how far -- given the range, it could be 320' for my level 6 cleric, which is quite a distance. It's not specified that the weapon has to stay in range, which seems like a sensible constraint. None of these is earth shattering, but I'd especially like to know the actual duration. The spiritual weapon can be moved anywhere within the spell's range. Here's another one: The Daylight spell states that "Daylight brought into an area of magical darkness (or vice versa) is temporarily negated, regardless of the spell level of the magical darkness’s source." It then says that "Daylight counters or dispels any darkness spell of equal or lower level, such as darkness." The latter would seem to supersede the former. Additionally, the Darkness spell states that "magical light sources only increase the light level in an area if they are of a higher spell level than darkness." This also seems to contradict the first statement. Daylight can counter or dispel darkness in the same way that slow can counter haste. (See page 322 of the Core Rulebook.) So, in the second sense, it mean "counter" in the sense of "counterspell." Okay, so if I cast daylight on an object and carry it into an area of magical darkness, it's negated, but if I'm in darkness when I cast it then the darkness is dispelled. Or if I have it readied (unlikely), then I can use it to counter and disrupt the darkness. Sorry if these are basic questions. Between the 2 books, there's a lot of material to absorb! I've played 5th edition D&D, but not Pathfinder. No need to apologize! Daylight works 3 ways, as you've guessed. 1) If you bring the object that you've cast daylight on into an area of magical darkness, it negates it. 2) You can ready a casting of daylight to counterspell darkness. Owen and I have gone through all feedback on the Starfarer’s Companion and are almost done the official errata document. Before we do that, however, we want to do one final call for any questions people have or issues people have seen in the book. We’ll be keeping this open until July 15th. Thanks to all of you for being awesome supporters! If you guys were curious, the missing list of ranger favored enemies are: aberration, animal, construct, dragon, fey, humanoid*, magical beast, ooze, outsider*, plant, undead, vermin. (* If you choose this type as a favored enemy, you must also choose an associated subtype. You can choose any race of humanoid or outsider for this purpose with GM approval. So what did you guys just update in this book? Okay, I should have looked more closely at that last post from June. Any updates besides the tables of ranger favored enemies and favored biomes? — We changed how racial energy resistance worst so it scales better at different levels of play. — We updated the mechanoi to reflect how construct PCs were presented in other official products. — We completely retuned the magus and paladin so they're better in-line with the Starfinder Core classes (specifically the soldier). — We cleaned up the wording on tons of class features, feats, racial traits, and spells. These are the big points off of the top of my head.